The project will create updated laboratory and classroom space for the Department of Natural Sciences within the Science Building. In order to accomplish this, approximately 20,000 gross square feet will be added to the building to create state-of-the-art laboratory spaces, a new elevator, loading dock core, and mechanical penthouse. The exterior walls will be extended and constructed in an energy-efficient manner to allow the entire building project to exceed standard energy performance by more than 30 percent. In addition, the project proposes a complete renovation of the existing building (approximately 80,000 gross square feet) for laboratories and classrooms. 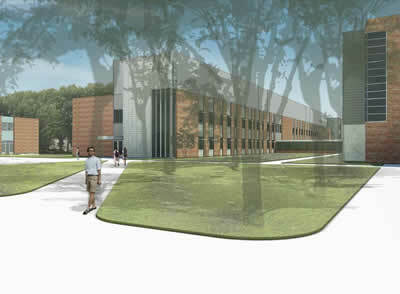 The project will also upgrade infrastructure that is shared with the adjacent Computer Science Building. Although there will be a temporary loss of some adjacent parking spaces during construction, there will be no permanent impact on parking from this project.